There are four boys namely Ajay, Vinay, Murari and Kiran and four girls namely Anima, Nishi, Ishita and Nimi in a group and each can complete a piece of work in different number of days. Nishi can complete the piece of work in 12 days. Number of days taken by Murari to complete the work is 25% more than the number of days taken by Nishi to complete the work. Ratio of number of days taken by Murari and Ajay to complete the work is 3:4 respectively. Number of days taken by Ajay to complete the work is 100% more than the number of days taken by Anima to complete the work. Efficiency of Anima is 50% more than the efficiency of Nimi. Respective ratio of the number of days taken by Ajay, Vinay and Ishita is 5:4:2 respectively. Number of days taken by Kiran to complete the work is 50% more than the number of days taken by Ishita to complete the work. Anima and Ishita started the work and left after 2 days. Find the number of days taken by Murari to complete the remaining work. If Nimi and Ajay work on alternate days starting with Nimi, find the number of days taken by them to complete the work. Find the respective ratio of the efficiency of Nishi and efficiency of Vinay. If Kiran works with half of his efficiency and Murari works with double his efficiency, find the number of days taken by them to complete the work. If all the girls work together, find the number of days taken by them to complete the work. Distance between P and Q is 450 km and two people travelled on day 1. 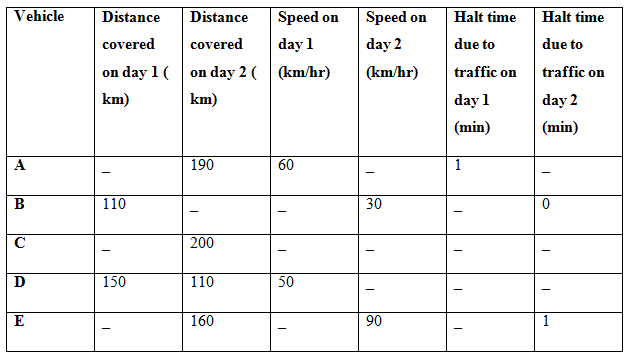 One by vehicle B and other by vehicle C from P to Q. speed of vehicle C is 20 km/h more than that of vehicle B. After travelling 2/3rd distance vehicle A stops for 2 hours and after that remaining distance is covered at 2/3rd of initial speed and reaches at Q. vehicle B after travelling 1/3rd of distance stops for 1 hour and after that increases its speed by 25% and reaches at Q at the same time as the vehicle C. Find the speed of vehicle A. Speed of a man driving vehicle E on day 2. After every 24 minutes he reduces his speed by 5 km/h. Find out the time taken to cover this distance. A man starts to travel with A on day 1 in order to reach his in - laws place and reaches 1 hours late. If he travels by vehicle E on day 1 then he reaches 2 hour early. What is the distance between his home and his in-laws place? Also find out the actual time taken to travel the distance. Considering no halt in between and distance covered is same. 1) Anima and Ishita started the work and left after 2 days. Find the number of days taken by Murari to complete the remaining work. 2) If Nimi and Ajay work on alternate days starting with Nimi, find the number of days taken by them to complete the work. 3) Find the respective ratio of the efficiency of Nishi and efficiency of Vinay. 4) If Kiran works with half of his efficiency and Murari works with double his efficiency, find the number of days taken by them to complete the work. 5) If all the girls work together, find the number of days taken by them to complete the work. 7) Distance between P and Q is 450 km and two people travelled on day 1. One by vehicle B and other by vehicle C from P to Q. speed of vehicle C is 20 km/h more than that of vehicle B. After travelling 2/3rd distance vehicle A stops for 2 hours and after that remaining distance is covered at 2/3rd of initial speed and reaches at Q. vehicle B after travelling 1/3rd of distance stops for 1 hour and after that increases its speed by 25% and reaches at Q at the same time as the vehicle C. Find the speed of vehicle A. 8) Speed of a man driving vehicle E on day 2. After every 24 minutes he reduces his speed by 5 km/h. Find out the time taken to cover this distance. 9) A man starts to travel with A on day 1 in order to reach his in – laws place and reaches 1 hours late. If he travels by vehicle E on day 1 then he reaches 2 hour early. What is the distance between his home and his in-laws place? Also find out the actual time taken to travel the distance. Considering no halt in between and distance covered is same.